Domestic sugar stocks rallied on Tuesday in the anticipation of improved margins and easing arrears positions after the Union government announced a Rs 2 per kg, or seven per cent, increase in the minimum selling price (MSP) of sugar, last week. According to Crisil, the MSP hike may add 3-4 percentage point to companies’ operating margins. Even sugar price in Mumbai wholesale market jumped to Rs. 3,229 per quintal and was quoted at 4 per cent premium to MSP. Such high price was seen for the first time since MSP was announced in last June. Trade sources said that the marriage season has been aided by demand from ice cream and cola makers who buy huge amount of sugar ahead of summer. They expect summer to be severe, like winter, which will drive cola and ice cream sales. Even the reports of hike in MSP was in market since last week of January which has slowed down sales by mills to bulk buyers and that demand is coming up now. The rally in share price also comes less than a week after the Centre announced a seven per cent hike in the minimum selling price (MSP) of sugar from Rs 29/kg to Rs 31/kg on Thursday. The improved realisation by selling sugar is projected to cut losses of mills accumulated over excess supply and tepid exports. 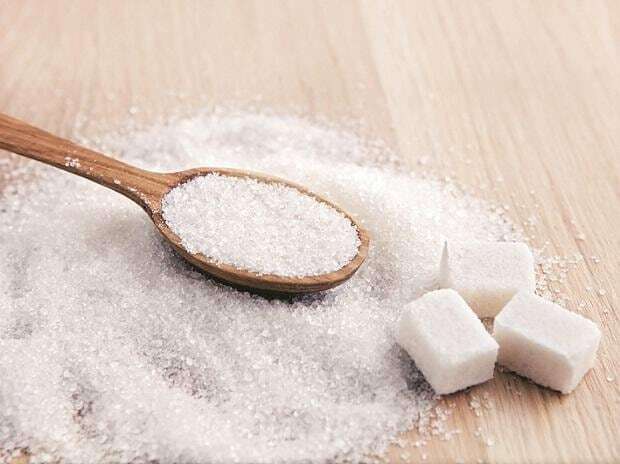 Among the top sugar stock gainers on the bourses were Dhampur Sugar (+9.3% on BSE), Bajaj Hindusthan (+5.2%), Dalmia Bharat (+3.4%) and Balrampur Chini (+3.8%). The benchmark Sensex and Nifty closed lower by -0.4% and -0.34% respectively. According to Crisil Ratings, operating margins of millers could improve by 300-400 basis points (bps) in the current sugar season (Oct 2018 to Sep 2019) following the increase in the MSP, which could lead to incremental domestic sales realisation of Rs 3,300 crore. Besides, higher export prices will generate another Rs 200 crore. That would help mills pare their accumulated cane arrears, which stand stoutly at more than Rs 20,000 crore, by almost 18 per cent to Rs 16,500 crore. UP mills alone account for half of these outstanding. The report mentioned that the raw material cost as a proportion of sugar sales had increased to nearly 90 per cent in the current season following an uptick in the sugarcane Fair and Remunerative Price (FRP) and low sugar prices due to oversupply, both locally and globally. However, the non-integrated sugar manufacturing units are likely to continue bleeding in the season as well despite the relief announced by the Centre to arrest the losses of millers, owing to limited sugarcane by-products basket. Higher MSP means non-integrated millers could break even or report low single-digit operating margins of 2-5% this season compared with 1-2% in the previous season, while integrated players could see that number up 13-15% compared with 9-12%, Crisil Ratings director Gautam Shahi said adding integrated players would also benefit by fast-tracking ethanol manufacturing. Since, global sugar production is expected to decline nearly 5% to 185 million tonnes (MT), which would support a gradual clearing of inventories and bolster prices in the current season going forward. Earlier, the government had mandated 5 MT of sugar export, however so far less than a MT of sugar had been exported.